Reading material for children includes more than just stories. Most academic materials are designed to have students apply and infer what they have just read. There are several options available, and you can get started with the ideas below. Where Can I Find Reading Materials for Children? There is an abundance of resources online to help educate readers of all levels. 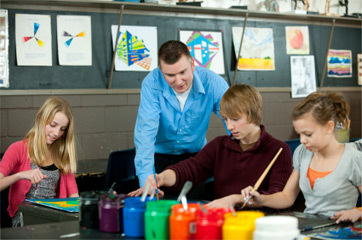 Many websites offer free printouts and worksheets for teachers and tutors to use, though some may require registration. Typically, you'll find short reading passages coupled with comprehension questions in the form of multiple-choice, short answer, matching and essays. While these worksheets are the most common, there are also interactive games and activities children can play to get acquainted with phonics, vocabulary, spelling and more. Beginning readers often start by learning sight words, or words that can be recognized instantly without phonetically sounding them out. If you're working with a young child, you can focus on learning these words through fun activities, like sight word Concentration or Bingo. If you're teaching or tutoring a slightly older child, practice materials should be more focused on vocabulary and context clues. Before the child reads a text, scan it for words that may be unfamiliar and create a worksheet for him or her to complete. Either provide the words and ask your child to select the correct definition from a list based on the context or have the child write out the definition in his or her own words. This activity should give you a good idea of where improvement is needed. A common, but effective, option is comprehension questions. There are countless passages and assessments online for children of all grade levels and interest areas. However, you can easily create your own as well. To help a child become a more engaged reader, ask him or her to complete a short passage and then answer questions about the text. The questions may be straightforward or, alternatively, can ask the child for his or her opinions and predictions. In order to help children become active readers, it's important to get them thinking about a text before they have even looked at it. To do this, try the K-W-L, or Know Want Learn, method. Before your child reads a passage, ask him or her to answer the following questions about the topic: what do you know and what do you want to know? Upon completion of the text, follow up by asking what the child learned and what still needs to be learned about the topic. This method promotes engagement and improved comprehension.